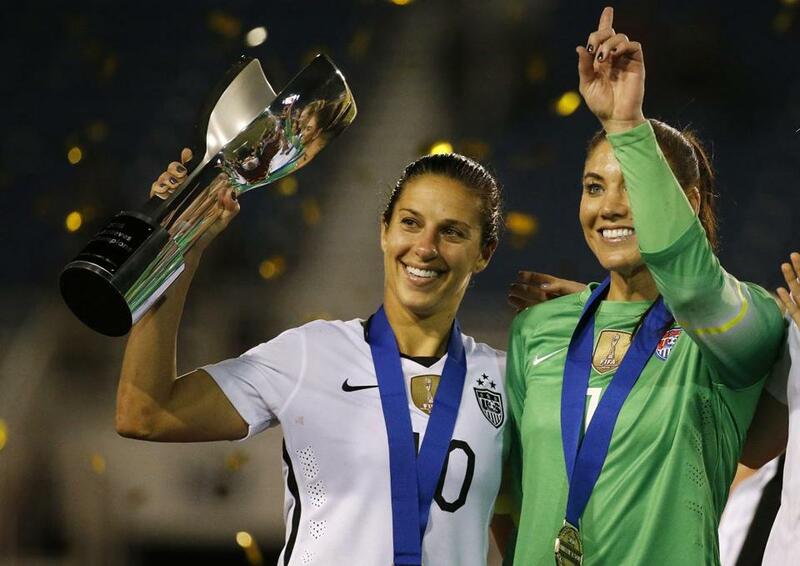 USA women’s national team soccer players Carli Lloyd (left) and Hope Solo celebrates their win of the SheBelieves Cup soccer tournament earlier this month. This can be a game changer, not just for soccer and sports, but for little girls and grown women everywhere. Mark your calendars, because today is the day that the wage gap should become an issue not for a few but for the many. What Billie Jean King did to elevate female athletes, now Carli Lloyd, Alex Morgan, Megan Rapinoe, Becky Sauerbrunn, and Hope Solo can do for fair pay. The women, members of the United States women’s national soccer team, this week filed a federal complaint alleging wage discrimination, and with it offered a high-profile argument that it’s not a level playing field for women in the workplace. They are the reigning World Cup and Olympic champions, yet their employer, the United States Soccer Federation, pays them in some cases close to 40 percent less than male players, according to the women’s lawyer, Jeffrey Kessler, who filed a complaint with the Equal Employment Opportunity Commission on Wednesday. Trust me, their legions of loyal fans will take this case to heart. The disparities, according to documents given to the commission, are found throughout their compensation, from base pay to bonus to per-diem travel. Female players on the national team earn $72,000 for playing 20 regular season games, plus bonuses for winning. Men, however, make a minimum of $100,000 for playing 20 games, get a victory bonus — and a smaller supplement for losing. If both teams won all their games, women would earn $99,000, while men could take home $263,320. Members of the United States women’s national soccer team this week filed a federal complaint alleging wage discrimination. The pay chasm widens when players participate in the World Cup. Female players who try out and make the team earn a total of $30,000 each. Men, however, get $68,750 each. With each advancing round, players get paid more, but the structure favors the men. In 2014, the men’s team earned a total of $9 million for losing in the Round of 16, while the women’s team last year got only $2 million for winning their entire tournament. The numbers are infuriating given that the US Soccer Federation projects that in the upcoming year the women’s team will generate $17.6 million in revenue in the United States, while the men will bring in $9 million. But outside our country, the male squad brings in more, reflecting that globally, men’s soccer far outstrips the women’s game in popularity. The women decided to file a complaint after the federation during a recent round of collective bargaining talks refused to grant equal pay, according to Kessler. Kessler is used to taking on sports leagues — and winning. Tom Brady hired him to fight a four-game suspension from National Football League commissioner Roger Goodell for the Patriots quarterback’s alleged role in Deflategate. In a statement, the soccer federation portrayed itself as an “unwavering” advocate for women’s soccer, including leading a campaign for the sport to be part of the Olympics in 1996 and pushing for the inclusion of prize money for the Women’s World Cup. “We are committed to and engaged in negotiating a new collective bargaining agreement that addresses compensation with the Women’s National Team Players Association,” the federation said. Groups of women — from investment bankers to Walmart workers — have sued their employers alleging wage discrimination. Some won, some lost. Meanwhile, the wage gap persists with women on average making 79 cents for every dollar a man earns. This means female employees have to work roughly 60 extra days a year to make the same amount as men. But when some of the most popular and decorated female athletes in US history come together to say we have a problem, it forces everyone to lean in and listen. Sports are one of the great unifiers in this country — and by taking a stand, these female soccer stars are fighting for much more than their own paychecks. 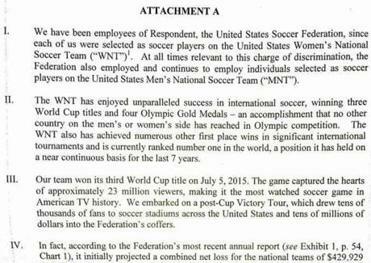 The soccer complaint comes at a pivotal moment in the battle for equal pay. Legislation under consideration at both the national and state levels would strengthen laws that protect women from wage bias and increase pay transparency. In Boston, Mayor Marty Walsh is embarking on an initiative to collect payroll data anonymously from employers in an effort to analyze disparities. He’s also offering free salary negotiation workshops for hundreds of women in the city. Taken altogether, closing the wage gap may be finally gaining traction. Evelyn Murphy, a former state lieutenant governor and an economist by training, has been studying issues around pay for years. Each decade came with a new argument on why female workers aren’t paid as much as their male counterparts. First, women weren’t working enough; then they didn’t have the same education and qualifications. Now not enough of them are in management. Murphy is optimistic an equitable paycheck is upon us. The pressure is everywhere, whether it’s venture capitalist Ellen Pao exposing sexism in Silicon Valley to actresses Jennifer Lawrence and Meryl Streep speaking out about the pay gap in Hollywood. The US women’s soccer team members may be in the most important match of their careers, and if they win, it will be a victory for working women everywhere. Globe correspondent Amanda Burke contributed to this story. Shirley Leung is a Globe columnist. She can be reached at shirley.leung@globe.com. Follow her on Twitter @leung. This story has been updated to provide a more specific comparison of the wage discrepancy between the women’s and men’s teams.